This beautiful master bathroom is designed by Sara Story for her New York home. 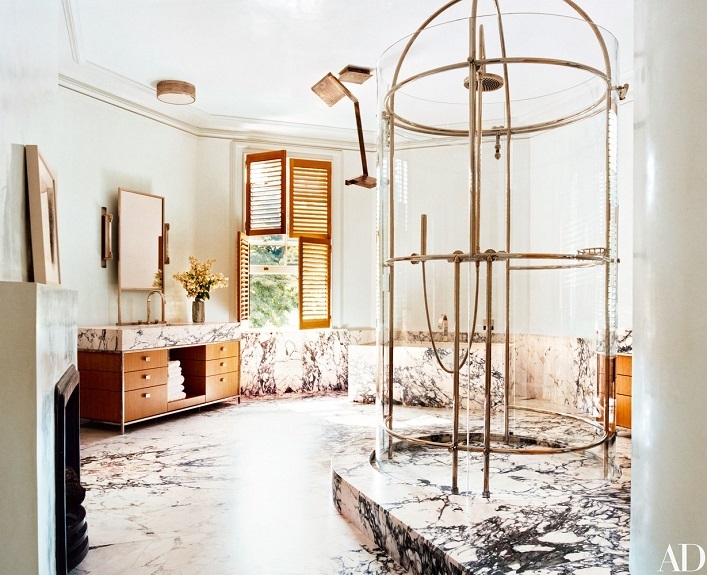 Clad in a striking Paonazzo marble, this bathroom instantly exudes an air of elegance and luxury. Another element I am particularly drawn to is the gorgeous circular glass shower enclosure. Its cool, unique design makes it awe-inspiring and extraordinarily chic. More than just making a design statement in the bathroom, this swoon-worthy glass shower enclosure is a work of art. The addition of natural wood from the vanity cabinets and window coverings help warm up the space. Such a thoughtfully designed space, what's not to love?